Marcus Aurelius Valerius Maxentius Augustus was Roman Emperor from 306 to 312. He was the son of former Emperor Maximian and the son-in-law of Emperor Galerius. When Constantius Chlorus died in 306, his son Constantine was crowned emperor and subsequently accepted by Galerius into the tetrarchy as Caesar. This set the precedent for Maxentius' accession later in the same year. 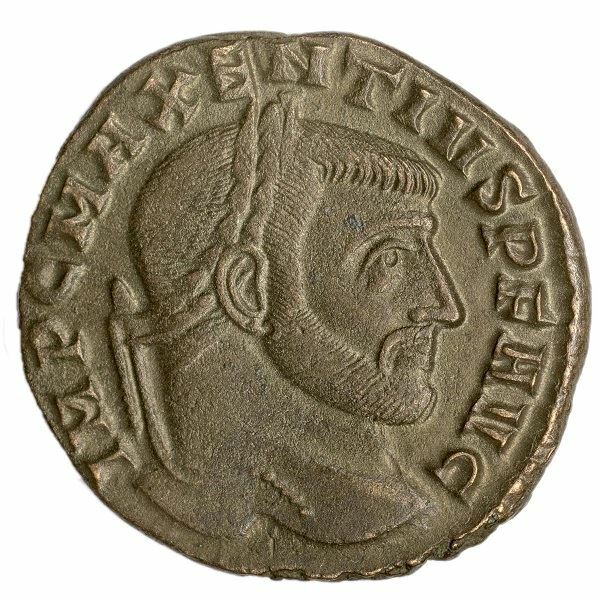 The latter part of his reign was preoccupied with civil war, allying with Maximinus II against Licinius and Constantine. The latter defeated him at the Battle of the Milvian Bridge in 312, where Maxentius, with his army in flight, perished by drowning in the Tiber River. Reverse: AETE-RNITAS A-VGN, Castor and Pollux standing facing each other, each leaning on sceptre and holding bridled horse. Ref: RIC 210; Sear 14987. Obverse: IMP C MAXENTIVS P F AVG, laureate head right. Reverse: AETERNITAS AVG N, the Dioscuri standing facing each other, their horses between; MOSTS in exergue.